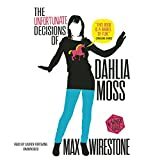 In this comic nerdy detective novel, Dahlia Moss is in her twenties and has been unemployed for over a year. She is living at a friend's place but not paying rent. She is desperate for money, so she is happy to take on the job when Jonah, a graduate student wearing a pirate costume, offers her a substantial sum of money to find the Bejeweled Spear of Infinite Piercing. It turns out that this is a weapon in massive multiplayer online role playing game. This seems like a silly assignment, but then Jonah is murdered. Dahlia continues her search despite his death. She gets involved in the online game, the people who Jonah played the game with, the police, and quite a few other colorful characters. The highlight of the novel is the climactic confrontation with the killer at a gamers' convention. It is entertaining and engaging, and often funny. The plot doesn't make a lot of sense, but that doesn't matter much. The performance of the unabridged audiobook by Lauren Fortgang is energetic and appropriately dramatic.